Enjoy year-round hunting with Blackwood Hunting & Recreation in Hayes County Nebraska. We have standard guided deer hunts, and we show you where you can find the pheasants and turkeys to hunt. You can hunt for deer, usually mule deer, as well as upland game and non-game species, including Merriam turkeys, and pheasant. We have been known to harvest a record-number of Boone and Crockett trophy deer. Hunting pricing varies. Check out the hunting trip accommodations and amenities that come with our packages. With every deer package, you get transportation to and from hunting fields. Pheasant hunters get maps of the area that they can hunt on. All you will need is your gun and tracking equipment. 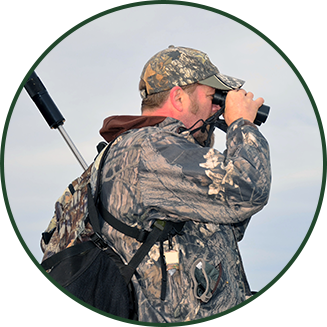 Our packages include 2x1 guide for big game and all hunts run from sun up to sundown. We believe hunting is a great family sport, which is why we provide a house large enough to accommodate families or parties with up to eight guests. We can even accommodate multiple families up on request. Unwind after a long day of hunting in our house right in Hayes Center. This roomy home has everything you need to make your stay enjoyable, including all the kitchen utensils you could want to whip up a hearty meal. If you prefer, walk a block to the town restaurant and meet some of the friendly locals in our small community of just under 300 people. We look forward to getting to know you. Optional services include lunch when you are deer hunting, lodging for your party, and you can purchase an upland game license on-site.